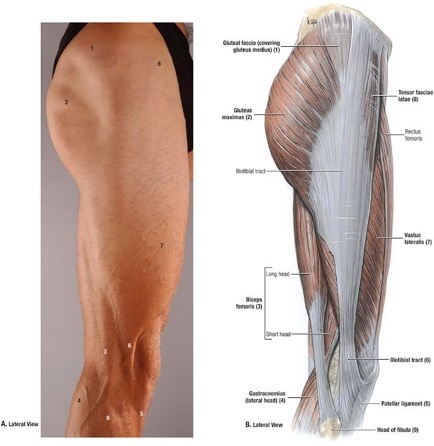 It is a tendinous and fascial band that extends from the gluteal muscles (glutes) and tensor fascia latae (TFL). It runs down the side of the thigh and attaches just below the lateral knee. Well, just like many other conditions in our bodies, the site of the pain isn’t always where the cause of the pain is. 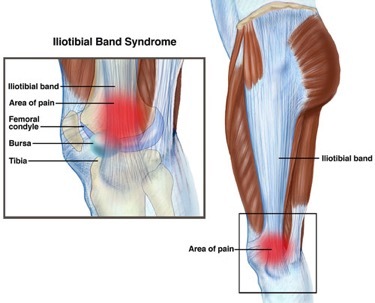 Very often, this lateral knee pain is not a knee problem, but rather a hip problem. We have many muscles in our pelvic area that move our legs and provide stability to our pelvis and hips while we are in motion. When these muscles become weak, or are not properly activated, we may lose stability in our hips causing abnormal pressure to be placed on our knees. As shown in the figure below, when the muscles of the hip are inadequate, they do not support the pelvis properly, which creates an imbalance when we walk or run. In the picture above, figure (a) shows this imbalance; in that the muscles on the left side of the pelvis are not stabilizing the pelvis when all of the weight is on the left leg. Therefore the right hip drops, creating too much pressure on the outside of the left knee when you walk or run. The abnormal pressure on the left knee may cause pain on the lateral or outside part of the knee. In the past, many practitioners have tried symptomatic treatments like stretching, massage or other types of myo-fascial release, dry needling, braces, or simply to stop running or doing what aggravates it. While these techniques may have some benefit, if you don’t correct the imbalance in the hip the knee pain may not fully resolve. If the hip problem is simply hip weakness, some simple glute strengthening exercises may be enough to stabilize the hips to take the abnormal pressure off of the knee. Below are a few examples of glute strengthening exercises. Perhaps you are someone that has IT Band Syndrome and has done everything you know to treat it as well as a million glute strengthening exercises, and are still having this problem? There may be other issues contributing, such as meniscus injury, ligament injury, or inhibition in your hip muscles, which are prohibiting your muscles from firing properly. In this case, you should have it assessed by a trained professional. While IT Band Syndrome is not a serious or life threatening issue, it can be very frustrating to runners or other active people. If you are struggling with this, you don’t have to stop running or just deal with it. We treat this condition as well as many other running related injuries in our office every day and would love to help you keep functioning at your best.